When you think of men of great influence, Ernest Hemingway surely tops the list. Hemingway lived in many places throughout his life, and we've always wondered what it would be like to take a peek into one of the homes of this iconic author. See what he saw as he looked up from his typewriter and took a sip of scotch, that kind of thing. Some of Hemingway's most notable works, including To Have and Have Not and For Whom the Bell Tolls, were written in his Key West, Florida residence. Hemingway, or "Papa", as he was affectionately referred to on the island, lived in the house along with his second wife, and a smattering of cats from 1931 - 1939. Hidden amongst towering palm trees and luscious gardens, this property gives you a unique glimpse into Hemingway's personal life and work. Conveniently, the house is located across the street from a lighthouse, which made it easy for him to find his way home after a long and undoubtedly raucous night of drinking. It's no secret that he had a reputation for being a heavy drinker, and when his favorite bar (Sloppy Joe's) moved locations, Hemingway took one of the urinals and moved it into this Key West home, stating that he had "pissed away" so much of his money into the urinal that he owned it. He converted this urinal into a garden fountain, where it remains today as a prominent feature and serves as a source of water for the ground's cats. Today, approximately 40-50 polydactyl six-toed "Hemingway Cats" roam freely around the property. Hemingway was given a polydactyl cat as a young boy, and rumor has it that the cats that currently occupy the grounds are descendants of this first cat, Snowball. The man lived for adventure, and besides being an avid sports fisherman and sailor, he loved boxing, and even went as far as to build a boxing ring in his backyard where he sparred with local boxers. Imagine being able to say that you got paid to punch a drunk Hemingway in the jaw, pissed in his stolen urinal, and were lucky enough to pet one of his odd six-toed cats, all in the place where he wrote some of the best work of his career. So, yeah -- Key West road trip anyone? 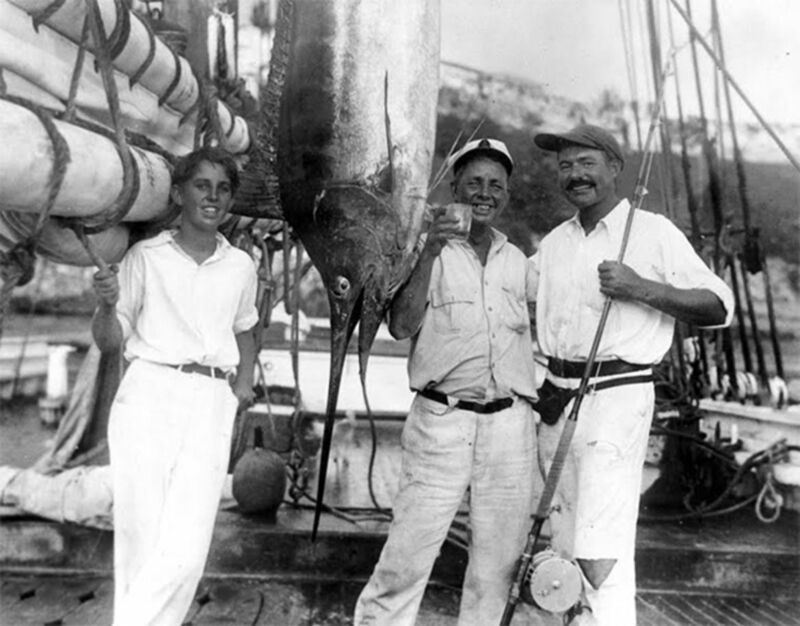 Pictures via the Ernest Hemingway Collection/John F. Kennedy Presidential Library & Museum. A couple of the photos (e.g. the last one) are from his time spent in Cuba but were too good not to share.